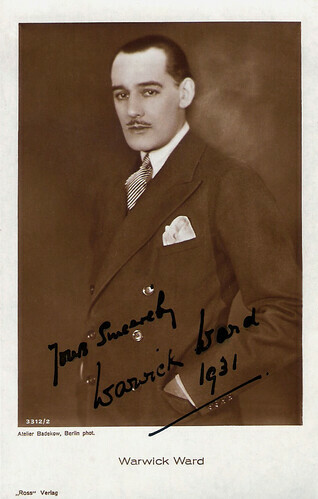 Handsome English actor Warwick Ward (1889–1967) appeared in 64 British, American, German as well as French films between 1919 and 1933. These included such silent masterpieces as Madame Sans-Gene (1925) and Varieté/Variety (1925). He also produced 19 British films between 1931 and 1958. 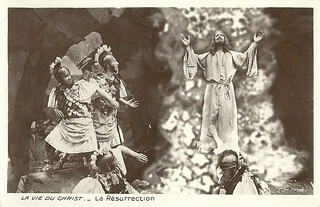 French postcard by Cinémagazine-Edition, Paris, no. 535. German postcard by Ross Verlag, Berlin, no. 1583/1, 1927-1928. Photo: UFA. Warwick Manson Ward was born in St. Ives, England, in 1889 (some sources say 1891). He made his stage debut in 1907, and had soon success in classical roles. 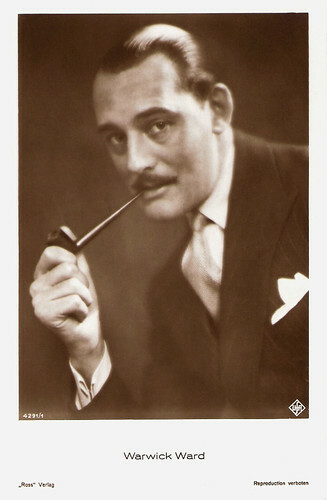 During the early 1920s he appeared in several silent British films. His film debut was the sports drama The Silver Lining (A.E Coleby, 1919). The following year he played in the Emily Brönte adaptation Wuthering Heights (A.V. Bramble, 1920) starring Milton Rosmer as Heathcliff, Ann Trevor as Cathy, and Colette Brettel as her daughter, Catherine Hareton. He appeared with Victor McLaglen in The Call of the Road (A.E. Coleby, 1920) and in Corinthian Jack (W. Courtney Rowden, 1921), with Henry Ainley in Build Thy House (Fred Goodwins, 1920), and with Milton Rosmer and Evelyn Brent in the drama Demos (Denison Clift, 1921), which is considered now to be lost. That year he also appeared in Belphegor the Mountebank (Bert Wynne, 1921), a British silent film starring Milton Rosmer. It was based on the play Belphegor, the mountebank: or, Woman's constancy (ca. 1850) by Charles Webb about a nobleman who is forced to take up the life of a travelling showman. Another lost film is the drama Tell Your Children (Donald Crisp, 1922) for which Alfred Hitchcock is credited as the title designer. 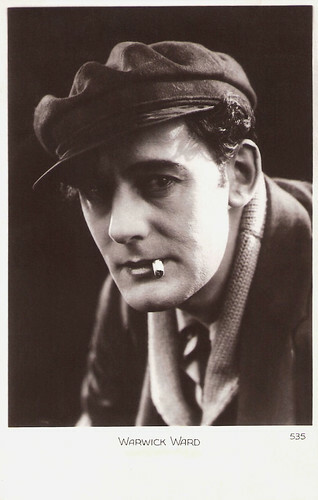 That year Ward also appeared in the British-Dutch action film Bulldog Brummond (Oscar Apfel, 1922). Hal Erickson writes at AllMovie: “Filmed in England, this first movie version of the stage melodrama Bulldog Drummond featured a miscast Carlyle Blackwell in the title role. Captain Hugh ‘Bulldog’ Drummond, the soldier of fortune created by ‘Sapper’ (H.C. McNeile), was a combination old-school-tie British gentleman and brutish fascist. Blackwell could handle the ‘gentleman’ part, but wasn't quite up to the tough, two-fisted aspects of the character. Still, the story itself is a good one: Bored by inactivity, Drummond advertises for ‘adventure’ in the Times, and gets adventure aplenty when he becomes involved with a plot to kidnap an industrialist. 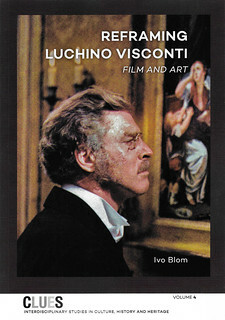 The film's tension highlight was the scene in which the villainous Lakington (Warwick Ward) taunts a bound Drummond by fondling unconscious heroine Phyllis Benton (Evelyn Greeley)”. Ward then starred opposite Violet Hopson in the sports films The Lady Owner (Walter West, 1923) and The Great Turf Mystery (Walter West, 1924), opposite Lillian Hall-Davis in the crime drama The Hotel Mouse (Fred Paul, 1923) and opposite Betty Blythe in Southern Love/A Woman's Secret (Herbert Wilcox, 1924). The latter was based on the poem The Spanish Student by Henry Wadsworth Longfellow about the young gypsy Dolores, who escapes from an arranged marriage and makes a living as a dancer. German postcard by Ross Verlag, Berlin, no. 3312/1, 1928-1929. Photo: Atelier Badekow, Berlin. German postcard by Ross Verlag, no. 3312/2, 1928-1929. Signed in 1931. Photo: Atelier Badekow, Berlin. Warwick Ward moved to France to appear opposite Hollywood diva Gloria Swanson in Madame Sans-Gene (Léonce Perret, 1925), a silent Famous Players-Lasky production by Jesse L. Lasky and Adolph Zukor. Swanson made this romantic comedy/costume drama while on an extended vacation. She helped to secure many of the filming locations (Chateau Fontainebleau, for example) herself. Soon she became involved with her interpreter Henri de la Falaise, a Marquis, although he was not very wealthy. He later became her third husband. Before her death, Swanson yearned to see this film. 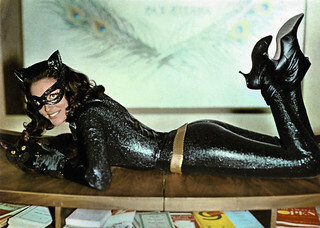 She considered it as her best work, but sadly the film is lost. After this Paris adventure, Ward moved to Europe’s film capital at the time, Berlin. 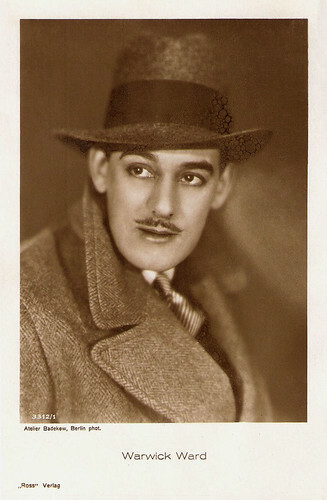 There he played in another silent classic, Varieté/Variety (Ewald Andre Dupont, 1925), based on the novel Der Eid des Stephan Huller (The Oath of Stephan Huller, 1923) by Felix Hollaender. The film tells the story of a carnival concessionaire (Emil Jannings), his alluring girlfriend (Lya de Putti), and the handsome acrobat (Warwick Ward) who comes between them. Feeling doubly impotent because he himself had been a famous aerialist before suffering a crippling accident, Jannings fantasises about killing his rival - and, finally, does so. The trapeze scenes were set in the Berlin Wintergarten theatre and camera man Karl Freund let the camera swing from long shot to close-up, like the acrobats. The results astounded international audiences. Ward stayed in Germany for such silent films as Die Fahrt ins Abenteuer/The Wooing of Eve (Max Mack, 1926) with Ossi Oswalda, the UFA adventure film Die Frauengasse von Algier/Streets of Algiers (Wolfgang Hoffmann-Harnisch, 1927) with Maria Jacobini and Camilla Horn, and Die berühmte Frau/The Famous Woman (Robert Wiene, 1927) with Lily Damita. One of his best late silent films is the circus melodrama Die Todesschleife/Looping the Loop (Arthur Robison, 1928) starring Werner Krauss as a clown with Ward (again) as the handsome acrobat who steals the clown’s pretty girl (Jenny Jugo). Another masterpiece was Die wunderbare Lüge der Nina Petrowna/The Wonderful Lie of Nina Petrovna (Hanns Schwarz, 1929) starring Brigitte Helm and Franz (Francis) Lederer. 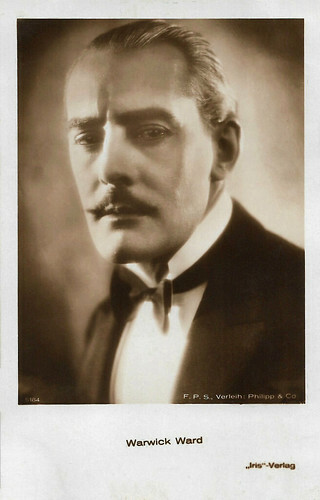 Meanwhile Ward also continued to make silent films in France and Great-Britain. German postcard by Ross Verlag, Berlin, no. 4291/1, 1927-1928. Photo: UFA. Austrian postcard by Iris-Verlag, no. 6164. Photo: F.P.S. Verleih: Philipp & Co.
After the arrival of the sound film in Germany, Warwick Ward had to return to Great Britain. There he appeared opposite Pola Negri in the late silent film-with-sound-effects The Way of Lost Souls (Paul Czinner, 1929). He reunited with Lya de Putti for the British sound drama The Informer (Arthur Robison, 1929). Hungarian De Putti's voice was dubbed – not with an Irish accent, as the character called for, but, for some reason, with an upper-class English accent. The film was based on the novel The Informer by Liam O'Flaherty which was again adapted in 1935 by John Ford. 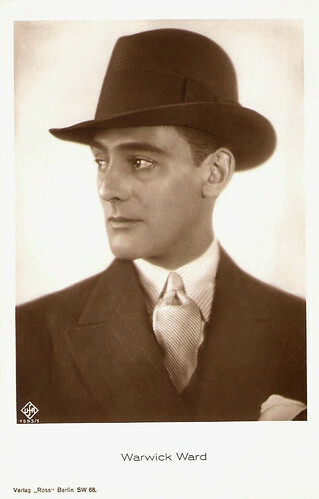 In the British musical comedy A Man of Mayfair (Louis Mercanton, 1931), Ward starred with Jack Buchanan, and in The Loves of Ariane (Paul Czinner, 1931) his co-star was Elisabeth Bergner. He appeared in a few more supporting parts, such as in the English version of the German world success F.P.1/ F. P. 1 Doesn't Answer (Karl Hartl, 1933) starring Conrad Veidt. But his acting days were over. A few years earlier, Ward had started to produce films, and in the following years he would produce such British comedies as Save a Little Sunshine (Norman Lee, 1938) starring Dave Willis and Patricia Kirkwood, about a man who buys a share in a hotel after he is sacked from his job. The film was made by Welwyn Studios, an affiliate of ABC Pictures, at their Welwyn Garden City Studio. He also produced a further film with Willis and Kirkwood, Me and My Pal (Thomas Bentley, 1939). During the war years he produced for Welwyn such crime thrillers as Suspected Person (Lawrence Huntington) with Patricia Roc. After the war he returned to comedies, which he now produced for Associated British Picture Corporation (ABPC). Among them are Quiet Weekend (Harold French, 1946) with Derek Farr, and The Dancing Years (Harold French, 1950) starring Dennis Price. Warwick Ward continued to produce films till 1958. He died in 1967 in Welwyn Garden City, near London, at the age of 78. 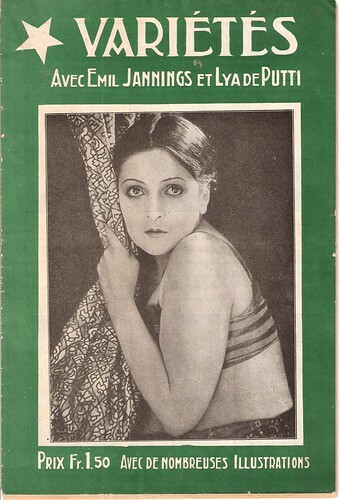 Belgium brochure by Patria editions, Antwerp for Varieté (Ewald André Dupont, 1925) with Lya de Putti on the cover. 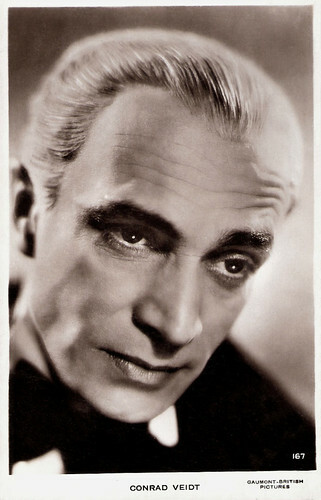 Conrad Veidt. British postcard by Real Photograph, no. 167. Photo: Gaumont-British Pictures. Dennis Price. Dutch postcard. Photo: Eagle Lion. Sources: Hal Erickson (AllMovie), Thomas Staedeli (Cyranos), Wikipedia (English and German) and IMDb.